Oui, oui I was in a very French mood that day. 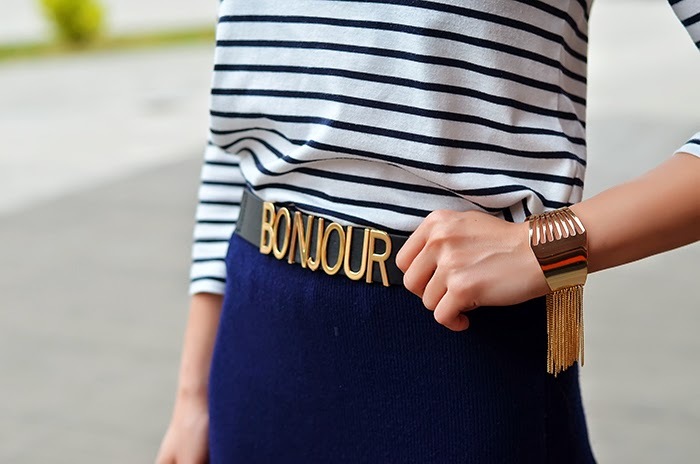 Black and white stripes always make me feel this way, but when you throw in a cute belt that says Bonjour, the tableau is complete. I wanted a simple and yet chic ensemble that would get me straight from work to a social fashion event. I mixed together some staple pieces such as the striped shirt and pencil skirt. La piece de resistance was this gorgeous fringed bracelet I recently picked up from Kristin Perry Accessories. It's an eye catcher for sure. Wow, this is so great! Amazing outfit and hairstyle! am fost si eu pe-aici :) imi pare rau ca nu ne-am vazut, dar data viitoare for sure!